Video production has become a 21st century literacy. Once the domain of those with access to expensive production equipment and skills, these days (thanks to online networking sites like YouTube and Vimeo as well as editing software like iMovie and Moviemaker) video production as become almost as common and essential as word processing. Vodcasting is video podcasting. It is a Web 2.0 tool to present content and encourage feedback. Where podcasting is like a radio program that you download on demand (at your convenience), vodcasting is like a TV show that you download on demand. Advantages of vodcasting over podcasting are all the visual stimulus that can be used just as still & moving images and animated text. Coinciding these tools with podcasting features such as voice overs, sound effects and music sound tracks, you have a very effective communication tool. Question – How effective can vodcasting be for learning and teaching? It is not just the film and TV industry that is looking for people skilled in this area. YouTube, Vimeo and other video based online networks have enabled anyone the ability to publish to a mass audience at little to no cost. Small and large business, education institutions, the public service and many more are acknowledging this phenomenon. Having good video literacy skills is a great advantage when training employees, marketing products, teaching young people, educating the community on a range of health and welfare issues, lecturing university students – the examples are endless. Digital video is becoming the main media of the 21st Century and schools should be investing in preparing students for a world where YouTube is becoming a more popular choice of viewing than free to air TV. There are a wide range of video/film competitions for young people within which schools are encouraged to participate. The VITTA Video Challenge (formally known as 3in6/1in6) now is an international competition run by VITTA (Victorian Information Technology Teachers Association). 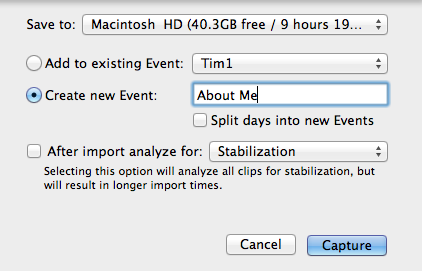 It involves making a 3-minute video (or 1 minute animation) in 6 hours. This year, it will be held in Term 2 with the winning entries being played and awarded at Federation Square in Melbourne during the 2012 ICT Week. 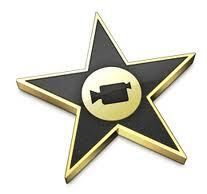 The aim of this workshop is to create a simple iMovie sequence and load it to YouTube and Vimeo. The video will have a combination of moving images, still images, music, transitions and titles. The program iMovie is part of the Apple iLife suite of software that comes with all Apple computers. You do not need to pay extra for iMovie. GarageBand is also a part of the iLife suite. We will use GarageBand to create the music backing track for our sequence. 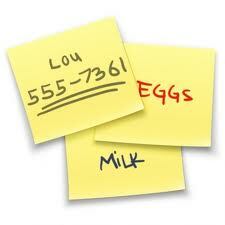 The other Apple software we will use is Stickies which also comes with every Apple computer. It is a great text editor that we will use to create the script. Pre Production involves all the things that need to be organised before and during a shoot. Planning the shoot properly in pre-production saves time in the long run. Have a very good idea of what your are shooting before you take the camera out on location or set up the studio shoot. Scripts tell you the size of the cast, the number of locations and the type of locations. Use locations as near to each other as possible and minimize location moves to save time. Wherever possible, find locations where available light can be used, thus minimizing lighting set-ups. The best light is sun light – especially when there is cloud cover and less shadows cast. For the purposes of this session we will be shooting from the web camera on the computer in front of you and using the available light in the seminar room. 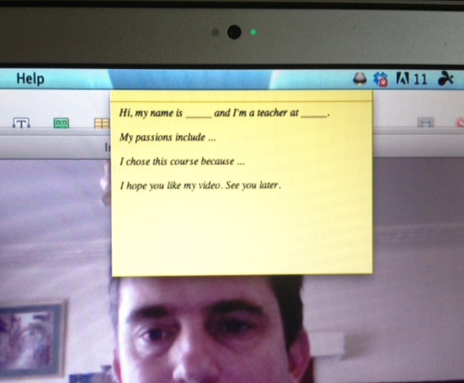 The video sequence you are about to create is about you and why you chose this seminar. Hi, my name is _____ and I’m a teacher at _____. I hope you like my video. See you later. This will allow your script to be visible no matter what other program you are running. 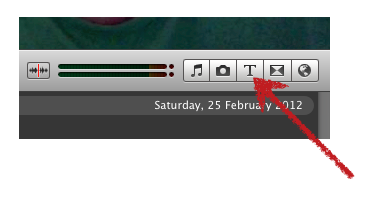 Open the program iMovie (Applications > iMovie) which is probably on the Dock. 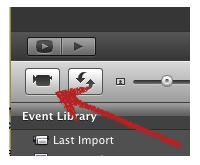 Ignore any video introductions or registration windows that may appear if this is the first time you have used iMovie. Choose the No Theme option in the Project Themes window, provide a name for the movie eg ‘About me’, set the aspect ratio to Widescreen 16:9 and the frame rate to 25 fps (frames per second) – PAL. This should activate the web camera on you computer and you should be able to see yourself. If you have activate the Floating Window option on stickies then you should also be able to see your script. Place your script as close to the camera as possible so you create the effect of a teleprompter. – get as close to the microphone as possible for the best audio (the mic is usually near the camera). If and when you select an external camera to shoot with, make sure it has an external mic option and a headphones option for monitoring. – use the rule of thirds, have the subject slightly to the left or the right, not directly in the center, This is more appealing to the eye. – make sure your main light source is behind the camera and not seen on screen. If your camera can see a window with light coming in it will automatically adjust the exposure to suit the extra light and you (the talent) will become darker. When you have setup your framing, click the Capture button. A save window will prompt you to choose a location to save your project. I recommend that you create a new event for each project. When you click the blue Capture button, you will be recording. Don’t worry of you make any errors as these will be edited out later but try and get at least one good recording of script completed. 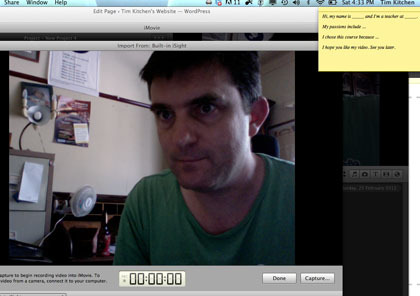 If you have a a MacBook laptop you may like to do the recording in a quiet space. A key aspect of video editing is cutting out the footage not required and keeping the good stuff. Here is a quick video tutorial that demonstrates a simple iMovie trimming procedure. Have a go at trimming (editing) what you have recorded. We are going to add an opening title sequence to your video. 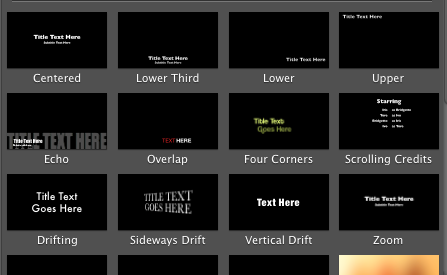 The iMovie program comes with a wide range of title styles. This will bring up the range of title styles available. This video demonstrates how to select a title style and use it in an opening title sequence. Another type of title effect is the Lower Third Title that often appears to describe the name of someone on the screen. This video explains how to add a lower third title. This video shows you how to insert a still image while keeping the audio running as a voice over. GarageBand is a fabulous piece of software for musicians and non-musicians. Musicians can use it to record their compositions and non-musicians can manipulate the 1000s of professionally produced sound loops that are sitting there waiting to be used. If you ever wanted to be a music produced, here is your chance. This video shows how to use GarageBand to find a professionally produced and copyright free soundtrack for your video. Once you have a sound track exported from Garage Band as an .aif or .mp3 file you are ready to go to the next step. This video demonstrates how to insert a soundtrack onto a iMovie 11 project. This video explains how to add a transition effect between edits. Before you can upload a video to YouTube you need to establish a free YouTube account. 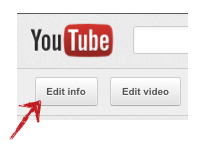 This involved opening the YouTube website the clicking the Create Account button near the top right of the site. 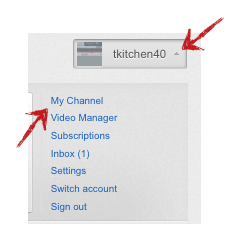 Click here to see a website that explains the process of setting up a YouTube account. Once your YouTube account is established, you can start adding videos. A message should appear indicating that your video has been uploaded but may take while before it is viewable. When your video has uploaded, you can click the Edit info button then the Settings button to control who can see the video. You have a wide range of settings to work with including the ability to add a password to the video. – Using students to teach the teachers, parents, grandparents and local community.